Mozilla Firefox 10.0 b1 RU - Mozilla Firefox - очень быстро работающий браузер, причем быстрота работы заметна не только во время загрузки веб-страниц, но и при поиске в закладках и Истории. Сделан он на основе движка Mozilla и позволяет просматривать все веб-страницы в одном многовкладочном окне, а также обладает множеством других полезных опций, включая способность значительного расширения возможностей подключением плагинами (а выпущено их великое множество). 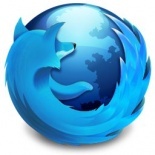 Mozilla Firefox 10 - faster, more secure, easier to use and sporting a new look, this latest Firefox release sets a new standard for web browser innovation. Firefox is small, fast and easy to use, and offers many advantages over other web browsers, such as the tabbed browsing and the ability to block pop-up windows. View Web pages way faster, using less of your computer’s memory. Take Firefox with you wherever you go. Synchronize your browsing across multiple devices. Forget clunky URLs – find the sites you love in seconds. Firefox has the most ways to customize your online experience specifically for the way you use the web. It is built with you in mind, so it’s easy and instinctive to use even the first time you try it. Thousands of Add-ons (little extras that augment Firefox to meet your unique needs) just waiting out there to help you do more, have more fun and be more creative online. Firefox keeps your personal info personal and your online interests away from the bad guys. Simply put, your security is our top priority. Отзывов о программе Mozilla Firefox 10.0 b1 RU пока нет!